App Lock Password Breaker – App Lockers are very famous these days. Every phone is installed with any of the app lockers available on Google Playstore. You need to handover your phone to your friends or any other persons? Now you don’t need to worry about privacy issues if you have App lock installed on your phone. But have you forgotten your app lock password you’ve set? or you desperately wanted to open any app on your friend’s phone? Don’t worry. There are App Lock Password Breaker available using which you can bypass appLock. AppLock by DoMobile Labs is the best and most popular app for App locker. It is launched in 2012 and currently more than 300 millions users have installed this app locker on their smartphones. There are several other app lockers apps available as well. You can use this App Lock Password Breaker for all the app locker apps. App Lock apps are coming with stunning features. Do you know you can even control incoming calls with App lock? You can do basic things like protecting particular apps with password or pattern or even fingerprint protection. There are more advanced features introduced like uninstall protection, hardware like Bluetooth control etc. So App Lock Password breaker methods will be very helpful to bypass these protection measures. So without much ado, let’s jump into the topic – App lock password breaker. 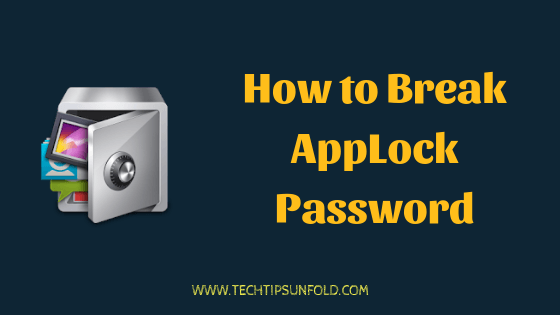 Actually there are several methods you can follow to break the applock password protection. We will be listing down all the methods in a step by step guide. Uninstalling the App lock application is one of the simple way to open the apps without knowing the password. But if you do follow this method, owner of the mobile may know that you have done this. Follow the step by step guide here to unlock the app lock password. Hold it by long press on the icon and you will get delete icon at the top of the screen. Drag it to that space. You will get Uninstall Applock? message with Uninstall button. Just tap on that – Refer to the below image. Now try to open the app which was protected by Applocker earlier. You should be able to open it without any issue now. Alternatively you can follow this steps as well to uninstall the AppLocker App. However the above mentioned method is more easy and convenient. Now you will find the list of installed apps on that particular smartphone. Tap on AppLock application in that list. Once you open that, you will find Uninstall button at the bottom of the screen. So this is one of the simple and straight forward method to hack the app locker password. 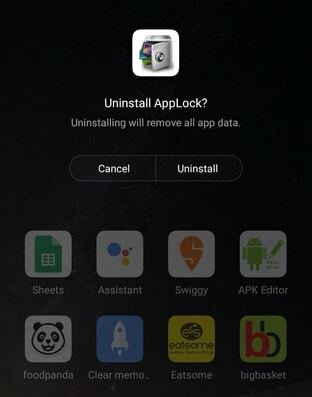 If you uninstall the app, all the data related to that app also will be deleted. So you need to set back all the locks you’ve set previously once again. There is another way to hack the app locker password without uninstalling the app also. You can simply force stop the app lock and get your things done. Here is the process on how to do that. 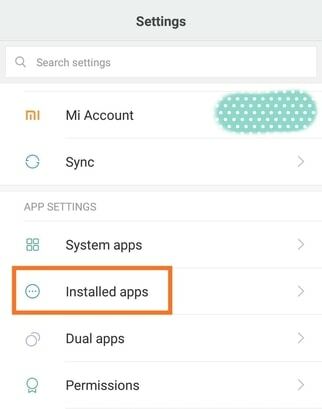 Now scroll down a bit to find App Settings and under that you should be able to see Installed Apps option. Just choose that. Now all the installed apps will appear. Select AppLock app from that. You will get all the options related to App Locker application now as shown in the image below. Three options will be there at the bottom. First click on Clear data option and then tap on Force stop option. App locker application will not be active now. You can try to open any protected app to check whether it is working or not. Once you are done with your work, just click on the app locker icon to get it up and running again. But most of the app lockers are coming up with more advanced features like locking the settings, controlling the hardware as well. In such cases, this method will not work as you can’t open device settings itself. 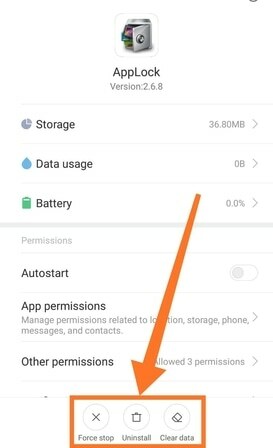 If the phone settings are locked by app locker, then you can’t force quit the app but you can simply uninstall it. Few of the app lockers even restrict the app uninstalls as well. There are many third party applications available in the internet you can use to break the app locker password. Install any third party applications like Dr.fone or Easy app uninstaller app. Are you done with your task? Install it back. These are the three simple and effective app lock password breaker methods available which you can make use of. App lock application developers are adding new features to their apps on regular basis. You can control everything on your phone with these apps. Most of the mobile phones manufacturers coming up with in-built app lockers. But most of the android users prefer to use apps like AppLock by DoMobile to get benefits of advanced app lock features. We do have lot of personal information stored on our mobile phones and also sensitive information like banking apps can be protected by these App lockers. AppLock by DoMobile has all the features like hiding photos and videos, hiding the apps and many more advanced features that you expect from every applocker. Every mobile phone is having any of these appLockers installed so if you want to get it opened without knowing the password, these listed methods will really helps you. I’m concluding this article on App Lock Password Breaker with this. If you still have any queries, do let us know through comments. We will be glad to help you. Cheers!